This covers all forms of drilled shafts or multi shaped barrettes or load bearing elements for picking concentrated loads. These construction processes involve excavation under slurry; the selection of slurry type is governed by ground conditions and ground water presence and elevation. Although practitioners may have specific habits, a mineral slurry is typically preferred in coarse granular soils and a polymer slurry offers more advantages in cohesive soils such as clays or silts. Heavy molecular weight anionic polymers are flocculants and cannot be combined with clay which limits their use to low permeability soils. WONDERMUD, PREMIX and PREMIX XXL are used as pure polymer slurry eventually with pH regulators and chelating agents if mixed or in presence of brackish or salt water. POLYBLEND-B and PREMIUM are compatible with mineral slurries and offer the most efficient and flexible mud formulation: behaving as a mineral slurry with respect to filter cake formation and as a polymer slurry with respect to the inability to suspend sand with the ability of the slurry to clean itself by segregation. If polymer is the only possibility but mud weight is an issue or gel strength is, our 3D GUM is a thixotropic biodegradable polymer that is an expensive bentonite replacement. When excavating through jet grouted or soil mixed soils, high pH and calcium may be detrimental to conventional mud systems either clay or polymer based. Our KC polymer is a biodegradable polymer that is not affected by Portland cement (Xanthan gum will gel in presence of Ca++ions). SEAPOLY is an expensive biopolymer that performs beautifully without any additive when seawater is the only make up water available. When excavating in fine sand where heavy molecular weight polymers have proven traitorous, a pure polymer slurry consisting of 80% POLYBLEND-B and 20% MICROPLUG has proven reliable to provide stability and filtrate control. This is particularly helpful on small jobs where the use of bentonite is burdensome. When bentonite slurry is used, filtrate control can be provided by addition of our very low molecular weight ANIONIZER polymer that has little impact on viscosity. When pure polymer slurry loss cannot be controlled by addition of MICROPLUG or its coarser partner PLUG, an option is to gel the bottom of the mud column where the loss is occurring and allowing the gel to permeate and seal the open formation and resume excavation shortly after. This localized investment in GELLAR may save a lot more in regular polymer slurry not lost and in preventing hole instability. Perimetral diaphragm walls or slurry walls generally act as support of excavation during the excavation phase in conjunction with ground anchors or tiebacks and as foundation bearing walls as part of the permanent foundation system. Typical slurry walls consist of reinforced concrete or soldier pile tremie concrete (SPTC walls). Diaphragm walls are most often linear in underground structures with the exception of circular walls used for tunnel access shafts or pumping stations. Other types of slurry wall may be cost effective: pre-cast concrete panels set in a self-hardening slurry. Similarly, steel sheeting and pre-fabricated soldier beam and lagging wall panels can be lowered in self-hardening slurry for temporary supports of excavation or integrated into the design final condition at a fraction of the cost of concrete slurry walls. The slurry technology for tremied or pumped concrete slurry walls is identical to that of drilled shafts, with the caveat that rectangular excavations are intrinsically less stable than circular ones and risk evaluation is most stringent. The same products listed in the previous paragraph apply. 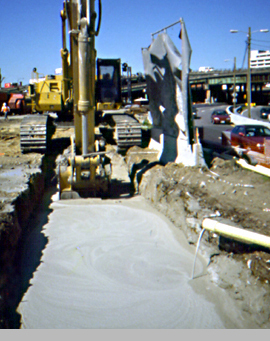 Chemical additives are often required to correct the mixing water or counteract the effects of excavation such as fines build up or cement contamination. pHBUFF, LESAP, HEXAM are chemical regulators, while AQUAFIX is a dispersing polymer that reduces the gel build up of a mineral slurry and reduces viscosity while allowing sand to settle at the bottom for an easy cleanup. Self-hardening slurries are quite different since instead of being displaced by the final product, they are part of it. While used as a trenching fluid, they must provide similar characteristics as mineral slurries over a proper period while in a cured condition they must satisfy specific physical properties. IMPERMIX® offers a wide range of formulations that will be detailed in a dedicated page. 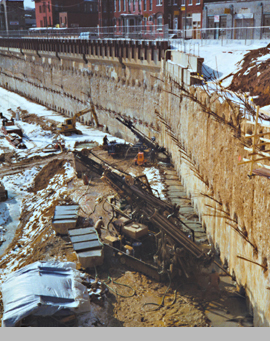 Except for internally braced excavations or auto-stable circular or ellipsoidal slurry walls, a linear support of excavation is generally held by anchorages, and most often soil anchors. A number of installation practices exist. 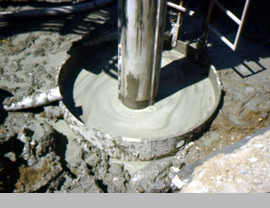 The quickest and most performing technique is the open-hole method drilled with an appropriate polymer slurry such as WONDER MUD, PREMIX or PREMIX XXL. Whether in sandy soils or in clay, the grout-soil interface is the cleanest possible, especially if the primary grouting is performed through the rods on the way out and the anchorage pushed in the grout filled hole. As of 1987, we have stopped recommending drilling for anchors with bentonite slurry and polymer slurry has been satisfactory almost 100% of the times. When excavations take place in low specific weight material or above very compressible layers, conventional backfilling with dirt or stone does not apply. Ultra lightweight backfill such as cellular grouts or synthetic foams are often used in dry excavations; fly ash flow-fills are economical, quite heavier and also must be placed in the dry. An IMPERMIX slurry can be used to excavate in the wet below the water table, at any depth and be left in place to constitute the backfill with a weight around 70 pcf and total cohesion. This is particularly interesting for backfilling behind steel sheet piling cofferdams since ground pressure behind the sheets can be largely reduced depending on the thickness of the backfill.